This topic describes product errands and how to configure them in Pivotal Cloud Foundry (PCF) Ops Manager. Errands are scripts that can run at the beginning and at the end of an installed product’s availability time. You can use Ops Manager to adjust whether and when these errands run. Post-deploy errands run after the product installs but before Ops Manager makes the product available for use. One example is an errand that publishes a newly-installed service to the Services Marketplace. Pre-delete errands run after an operator chooses to delete the product but before Ops Manager actually deletes it. One example is a clean-up task that removes all data objects used by the errand. When you click Review Pending Changes, then Apply Changes in Ops Manager, BOSH either creates a VM for each errand that runs or co-locates errands on existing VMs. Tile developers determine where BOSH deploys the errands for their product. 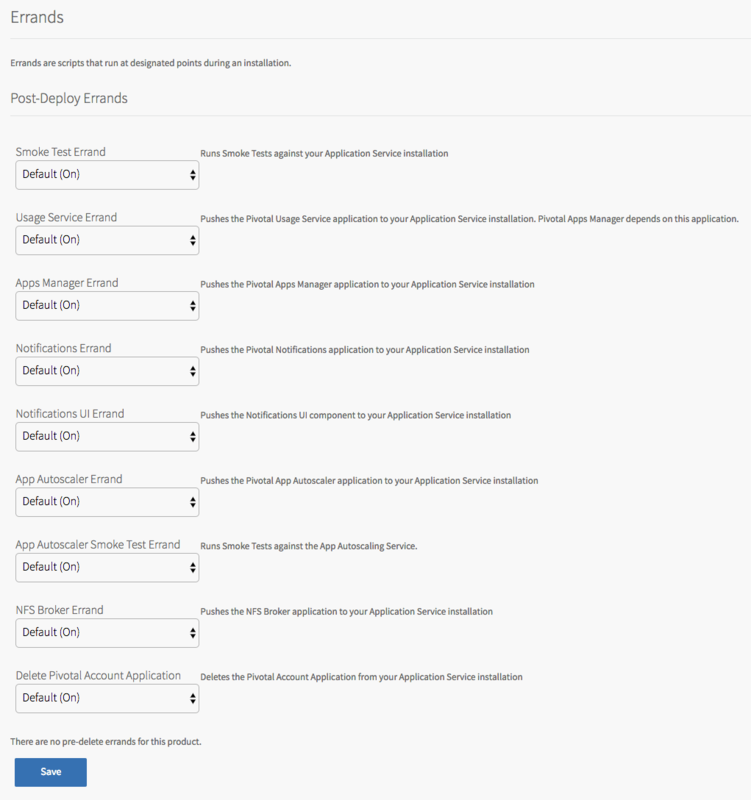 Pivotal Application Service (PAS) provides several post-deploy errands including smoke tests, Apps Manager, notification, Pivotal Account, and autoscaling errands. For more information about PAS errands, see the Deploying PAS topic for the platform where you are deploying PAS. For example, if you are deploying PAS on GCP, see Deploying PAS on GCP. For information about the errands associated with any other PCF product, see the documentation provided with the product tile. Operators can configure two different run rules for errands: On and Off. These rules control when Ops Manager executes the errand. When the errand is configured to be On, then it always runs, even if there are no changes to the product manifest. When the errand is configured to be Off, it never runs. By default, Ops Manager applies the On rule to all errands. For any errand, the tile developer can override these Ops Manager defaults with their own tile-specific defaults defined in the tile property blueprints. You can configure the run rules for errands in two places in Ops Manager. The Errands pane saves your configuration and applies the configuration to future installations. 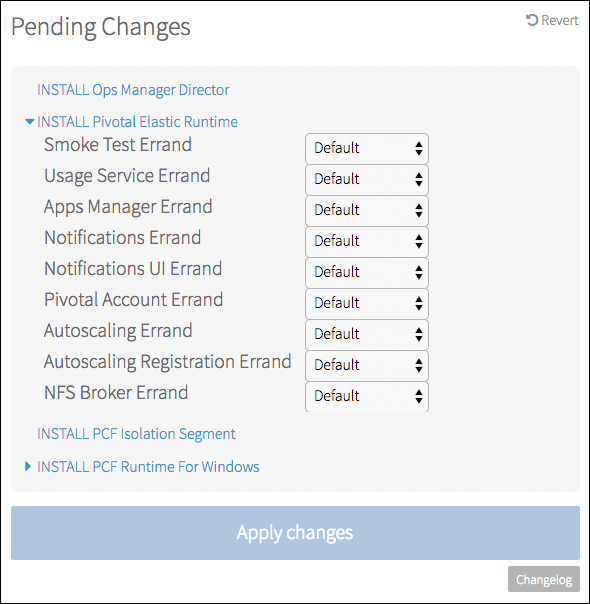 The Pending Changes view applies the rules only to the next time you run an Ops Manager install, without saving them. Product tiles for PAS and other PCF products have an Errands pane that configures the run rules for the product’s errands and saves the settings for later. The Errands pane lists all errands for the product and lets you select On or Off. The default option differs depending on the errand, and reflects the default setting used by Ops Manager for the errand or any tile-specific default that overrides it. Navigate to Ops Manager and click the tile to open it. Under the Settings tab, open the Errands pane. Use the dropdowns to configure the run rule choice for each errand: On or Off. Click Save to save the configuration values and return to the Installation Dashboard. Click Review Pending Changes, then Apply Changes to redeploy the tile with the new settings. Navigate to Ops Manager. The Pending Changes section at top right shows products that Ops Manager has yet to install or update. Under Pending Changes, click the product you wish to configure. A list of errands associated with the product appears. Use the dropdowns to configure the run rule choice for each errand: On or Off. Ops Manager applies these settings once you click Review Pending Changes, then Apply Changes to install the product, but does not save the settings for future installations. Click Review Pending Changes, then Apply Changes to redeploy the tile. If you are a product developer and want to learn more about adding errands to your product tile for PCF, see the Errands topic in the PCF Tile Developer Guide.